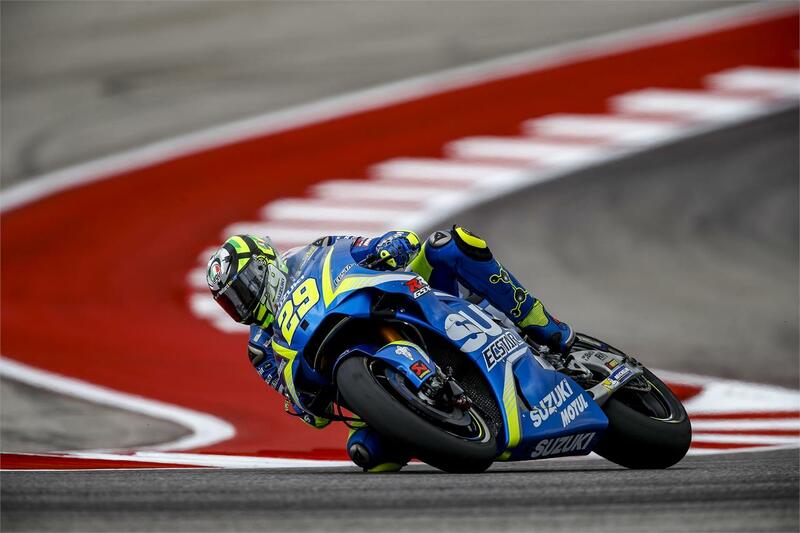 The GP of The Americas has started at the COTA circuit in Austin, Texas, with Team SUZUKI ECSTAR’s riders Andrea Iannone and Alex Rins having an intensive day looking for the best setup for their machines. The Italian was able to end the day in 10th place, thanks to a best lap 2'05.142, while the Spaniard is currently in 18th place with 2'06.155. After an electronics issue that made him lose some time, Iannone was able to run many laps to gather important information that turned out to be very useful for the afternoon’s session. In fact, he found more confidence on his GSX-RR and improved the lap time, ending into the virtual Q2 bracket. His struggle with ankle pain did not affect Rins’ performance much, as he made solid progress throughout the day. Although the morning was a little more challenging, the afternoon session was more comfortable and his performance improved. A technical failure of his GSX-RR at the early stage of the second session took some time away from him, and left him with only one machine available in the garage.